NantHealth Inc, ZTO Express Inc, and Valvoline Inc were among the worst-performing IPOs in 2016, but two of them are well-entrenched, profitable businesses that are worth looking at now. *Search was limited to companies with a current market capitalization above $1 billion. Data source: Bloomberg. Unless you have a background in the industry, deciphering the offering prospectus of healthcare information technology company NantHealth is no simple matter. Allow me to make a cheeky summary: It's a mish-mash of industry jargon and red ink. Compounding this challenge, NantHealth is classified as an "emerging growth company" under the JOBS Act, leaving you with a mere two years of financials to try to assess the quality of the business. NantHealth simply does not qualify as an investment; it's a pure speculation. There is a place for speculating, but given the nature of the company's business and the massive uncertainty regarding whether or not it will ever achieve profitability, it is fundamentally unsuitable for individual investors -- except, perhaps, as the equivalent of a trip to Las Vegas (i.e., for entertainment purposes only, and with money you can afford to see vanish). Getting comfortable with ZTO Express' business, by contrast, presents no such conundrum: With $1.3 billion revenues over the trailing 12 months to Sept. 30, it's the largest express delivery service in China, itself the world's largest express delivery market. The business is attractive: ZTO is part of an oligopoly in which the top four domestic companies controlled just over half of the market in 2015. These companies operate a "network partner" model whereby they manage central hubs and federate partners that are responsible for pickup and "last-mile" deliveries. FDX Total Return Price data by YCharts. Finally, one cannot discuss a potential investment idea without mentioning price: At 20.7 times forward earnings per share, shares look reasonably priced at first glance -- particularly in light of the business's attractive economics and the growth prospects. High-performing retail network: Valvoline operates the second-largest U.S. network of quick lube change retail stores, Valvoline Instant Oil Change (VIOC), with 1,068 locations at the end of September, up from 942 a year earlier (roughly two-thirds of the stores are franchised). VIOC may not be the largest chain, but company-owned stores deliver approximately a third more (36%) daily oil changes, on average, than competing stores. Valvoline's retail network is the heart of the quick lubes segment, which generated more than a quarter of the company's operating income in fiscal 2016. High-quality brand: Dating back 150 years to the creation of its first engine lubricant, Valvoline was and is "a highly recognized and respected premium consumer brand." Over time, and thanks to the company's focus, Valvoline's brand has become synonymous with innovation, which leaves it well-positioned to capitalize on the lubricant market's shift toward high-performance products. Core North America, the segment that sells to consumers and installer customers (car dealers, repair shops, etc. ), contributed roughly half of Valvoline's 2016 operating income. As you might expect for a business with these characteristics, Valvoline generates plentiful amounts of free cash flow and solid, if unspectacular, returns. 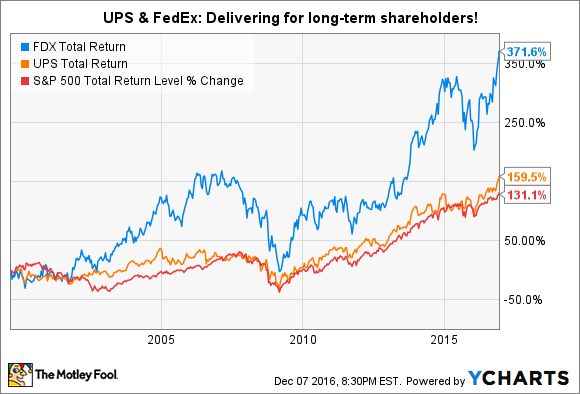 Don't let "unspectacular" (small-f) fool you: Boring businesses can earn their shareholders a lot of money over the long run! In fact, billionaire value investor Warren Buffett got involved in the lubricants market with Berkshire Hathaway's 2011 acquisition of Lubrizol (which is an important supplier to Valvoline). Speaking of value, at just 15.4 times forward earnings, Valvoline's shares are priced at a discount to peers and the broad market -- a minor Christmas miracle for a business of this caliber. Investors who get in at current prices may well find that the stock will contribute to lubricating returns to new levels of performance for years to come.